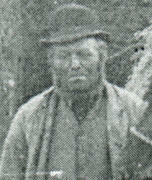 a woodman, perhaps working for his cousin Jacob Baggs the parish clerk. Had a great friend in the form of a robin, which梐s he told his granddaughter Jessie梪sed to tap on his bedroom window every morning at about 6 a.m. and call out "Henry!" to waken him; it would then follow him to the woods where he was working, and perch on his knee to share his lunch.